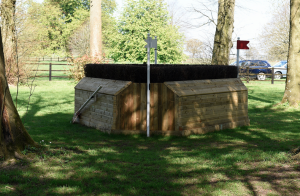 Mitsubishi Motors Badminton – last-minute XC Course Analysis. O.M.G. XC action gets under way in about 40 minutes. Here’s a last-gasp preview for die-hard xc fans who want yet another perspective! I finally had a chance to walk the XC course on Friday evening. First reaction… crikey. This is BIG. I have walked countless 4* courses over the years, this is the biggest I have seen for a LONG time. It is retro. There are lots of big parallels, for example. It is definitely kick-on and encouraging (in a mahoooosive kind of way), not twisty. It needs bold forward riding, nothing hooky-looky. Part b of Huntsmans Close. The photo shrinks this by about 50%. It is humungously big. Photo by Kit Houghton for Mitsubishi Motors Badminton Horse Trials Galleries. There are three big straightforward fences to get them going, then through very undulating ground and turn to a big airy parallel, before the first real question at 5, The Savills Escalator: a Giuseppe classic, huge spread followed by a steep downhill curve over two superskinny brushes. It is very reminiscent of his ‘targets’ fence at the Pratoni Europeans which claimed many notable scalps, and which was negotiated brilliantly by the Brits. Any horse which is not totally looking for its fences and locked on is going to have a very expensive and frustrating ‘drive by’ at this point, and I can see it taking a few prisoners, some of whom might well call it a day and reroute to Luhmühlen. This is not a course to jump with the handbrake on after a disappointment, it needs true conviction and attack. The Silver Birch parallels come next and are a let-up question really, a nice curve between them should give perfect striding, but they are big and airy. Then the big Rolex Grand Slam Triple bar (a very solid-looking parallel) on a related distance to The Lake. Back to its formidable best. The direct route is VERY testing. In over a fairly kind (but big) sloping log pile with significant drop into the water, then a tight turn to an upturned boat. Anyone a tiny bit disorganised after that big drop in is very likely to have a shocker at the boat. Last year there was a lot of room between the drop in and the brush-topped hedges, allowing time to get reorganised (even the great Michael Jung and La Biostheque Sam had to take advantage of these precious few seconds! ), plus the brushes were fairly forgiving of a misser or a scrappy jump. The boat is a LOT closer, on a tight turn, and won’t forgive a millimetre. After the boat, it’s direct out over the jetty – this will be the least of their problems, I predict. The long route, typical of Giuseppe, will take you pretty much via Bristol. Anyone doing long routes today is not very likely to figure in the prize money. A couple more formidable ‘let up fences’ (and the Chase Fence is absolutely GINORMOUS, it looked to my currently-BE100-honed eye like a barrier, not a particularly jumpable fence!) then the Shogun Hollow is a steep grassy dip followed by a big brush-topped box. Come out of the hollow on a half-stride, and it won’t be pretty. I can see a horse or two banking this, which is doable. Then the Outlander Bank. Last year’s step up to Owl Hole jumped surprisingly easily for 99% of the field, but this time Giuseppe has added another of his favourite super-skinny brushes, on a curve after the descent off the bank. From the side, it looked to me like a decent 3 stride distance. Anyone launching hugely out of the Owl Hole (as one or two did last year) is going to have a very exciting two stride distance… or not. Horses looking for flags will fly it with aplomb, but if they’re distracted, it’ll be drive-by time. Then there’s a hill, a real hill, in Badminton Park! I’m not quite sure how Giuseppe found this, but it’s there. Uphill to the totally new Gatehouse New Pond. In over a nice upright (any hanging knees will be swiftly punished), through the water, and then out up the bank and over either a BIG wide open silver birch corner on the left, or an upright on the right. The upright doesn’t seem to take many more seconds, and that’s the route I’d take. It’ll be interesting to see how many riders go for the corner to save those few seconds. The Vicarage Vee is back in all its daunting glory. There is a rope dressing on the right on the approach to help the riders a little with their line. The best will sail it as if it’s just an upright, but any deviation, any miss, any doubt, any landing short, will be hugely penalised. This probably requires more accuracy than any other fence on the course. The Mirage Pond is probably the trickiest I’ve ever seen it. In over two steeply angled hedges, through the water on a sort of dogleg to another angled hedge. The best will of course make it look like a gymnastic exercise… but if they’re a tiny bit off their line or their distance, or there’s the slightest delay in reacting, it won’t be easy to salvage. The FEI Classics Stick Pile is a huge old-fashioned log pile let up fence to reward the horses for previous jobs well done. It is one of the very few fences out there I quite fancied jumping! A few more ‘let up’ fences (although huge) and then the final huge test, Huntsman’s. This is taking no prisoners. A big flower-topped log in, under the trees, curve to a stonkingly big corner, and then curve round to another. The front red flag has been left off this one, so there’s only a red flag on the back side of it, which I think might make it harder for the horses to look for their flags. 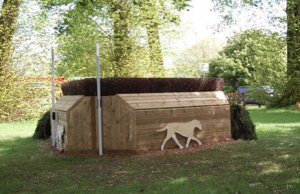 There’s a wooden hound detail on the front to aim for, but I can see this causing a lot of glance-offs if riders are not spot on and horses totally trusting, especially as horses will be tiring by now. Make no mistake, this is an enormous test. The Horsequest Quarry is next: down over a traditional Quarry wall, bend round to a big house fence. Part 3, a big wall approached uphill, has been removed this morning, as the slope up to it would have deteriorated badly given the amount of rain we’ve had. The double of Countryside Hedges, with their scooped tops, is another ‘reward’ fence, although still dauntingly big unless you’re a 4* rider on a 4* horse! The final question is the double of Rolex Presentation Boxes, and unless my eyes deceive me, the question has been strengthened from last year, they look to be on much more of an angle. I don’t think they caused a single problem last year, but I think they might be punishing if either rider or horse loses focus or accuracy in the excitement of being nearly home and dry. Then back into the arena, to a deafening wall of sound, and the usual turn over the final flower bed (now THIS one looks jumpable, I like this fence, please!) to finish. Anyone getting round here clear and fast is a master/mistress of their profession. This takes NO prisoners. It will detect and lay bare any holes in training or confidence or ability. Paul Tapner’s prediction of only about 5 clear inside the time may well be very accurate. Ground conditions will deteriorate, after heavy rain overnight it is raining now, and there’s more forecast for this afternoon. Those running early might have a big advantage. The very very best of Good Luck to all competitors. May everyone come home safe and sound. 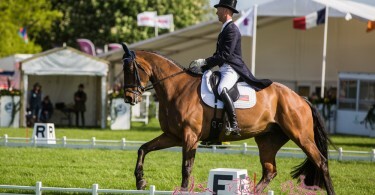 Mitsubishi Motors Badminton Horse Trials: Dressage Day 2.